Welcome to All Seasons Chiropractic! When you contact our office to schedule your first visit, our helpful team will answer your questions and request you complete some forms to give us an initial understanding of your health history and current concerns. You can complete those documents at your first visit or, for your convenience, you can download the necessary forms, fill them out before your appointment and bring it with you. When you arrive, you will be warmly greeted by our team and directed to our reception area. You will notice right away how different your experience at our office will be. We use the latest in computer technology at our office to make it run efficiently. 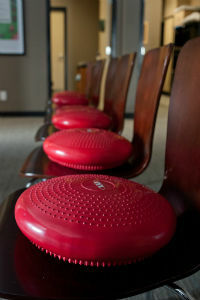 Our reception area is an “active zone” where our patients prepare for their adjustment by warming up their spines. 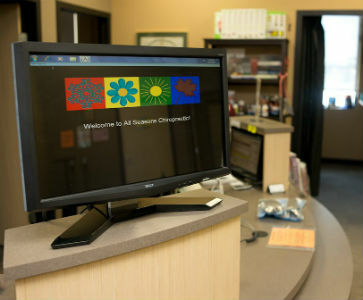 We have a large screen television on which we run slideshows providing our patients with chiropractic education and general health information as well as advising of upcoming events. We also have a spinal rehab area which includes traction units and vibration plates. Digital x-rays taken onsite (if necessary). Your initial visit will take between 20-30 minutes. When we are done, we will schedule you for a return visit to give Dr. Trevor time to review what he found. We aim to get you back for your second visit as soon as possible. Upon your return, Dr. Trevor will go over the results of his examination and any testing that has been done. He will show you where any misalignments in your spine exist, explain how that is affecting your body’s function and outline what needs to be done to correct your spine so your body can start working properly again. He will discuss options to address the issues you are experiencing and get your health back on track. On your subsequent visits, you will learn how to scan into our computerized system when you arrive, how to warm up before your adjustment and how to utilize appropriate rehab equipment. You can expect to spend about 10-15 minutes with us at each visit. We do our best to keep your time with us efficient and effective. During the course of your care, you will be re-evaluated at regular intervals to chart your progress. We may take follow-up nerve system tests or x-rays to show you how your body is changing. Dr. Trevor will also talk to you about different aspects of your health, giving you information to make important, incremental changes in your life. Informational pamphlets, books, DVD’s and supplements are also available to you and you are welcome to attend any of our workshops. We want to help make a difference in your health. Contact us today to book your first appointment!